I’ve been thinking about an ‘appropriate’ image for this for quite some time, so here we go. All that I added was ’21st Century Style’. Follows some thoughts I had last year. If accepted for publication, my co-authors and I will deliver something of substance in the New Year. make up an integral part of our mind and body. It was an Albrecht Kossel who was awarded a Nobel back in 1910 as the first to recognize that nucleic acids contained a carbohydrate. Due to its 5 carbon molecular structure, he called it pentose “the stuff of genes”. During the first half of the last Century, the chemical and biological structures of carbohydrates were very much a point of focus. Whilst this was to become an integral part of modern day molecular biology, at the time, they were not forerunners unlike other major classes of molecules. Largely, this was due to their (very) complex structures, difficulty in understanding their sequence(s), and the fact that their biosynthesis could not be directly predicted from the DNA template. Something called heparin was “discovered” by a second-year student at John Hopkins University in 1916. By the 1930’s, heparin came into use namely as an anti-coagulant. Essentially, this was made using animal ‘by products’ such as pig, dog and later, bovine gut material. By the early 1940’s, “purified” heparin was available for clinical and experimental use. Post WW2, Germany was unable to import heparin and there was also a shortage of many basic resources such as sugar. A novel method of deriving synthesized heparin type substances led to the development of sulphanated pentose sugar made essentially from the bark of beechwood trees. The most commonly used term these days for this particular (Polyanion) substance is Pentosan Polysulphate or PPS. Its most common broad (oral) usage commenced in the 1960’s and continues in many countries (namely USA and mainland EU) in relation to the management of the common bladder complaint, internal cystitis (IC). SP54 (the purest form of PPS known continues to be manufactured by a small family run German company, Bene. Here is a page from the Bene website that lists it’s currently known broad usages. Around the same time, Germany, Japan and the (former) Soviet Union also focused on Xylitol which is a five-carbon sugar alcohol, a natural carbohydrate which occurs freely in certain plant parts (for example, in fruits, and also in products made of them) and in the metabolism of humans. Xylitol has been known to organic chemistry at least from the 1890’s. Where there is deficiency or excess of (Proteoglycans) PG’s this can play a lead role in the pathogenesis of a substantial range of common and rare conditions ranging from arthritis, diabetes, cancer, HIV/Aids through to protein folding neuro degenerative conditions such as Alzheimer’s disease (AD). Semi synthesized HSPG’s (Heparan Sulphate Proteoglycans) over the last few years in particular are now referred to as Glycans. There are 14 Glycans in the family including Glypicans. In 2005, Nature published a seminal Paper by Professor’s Fuster and Esko (5) entitled “The Sweet and Sour of Cancer: Glycans as Novel Therapeutic Targets” which reported on several significant developments. In this Paper, Fuster and Esko et al demonstrated the potential use of Glycans in the treatment of many types of cancer/tumor and concluded the Paper with a “(this) might represent the ‘tip of an iceberg’ of therapeutic potential that awaits future discovery” type ending. Have matters progressed since then? Glycans have now been brought into real time Clinical usage, namely as surrogate markers in the treatment of a number of cancers. How far are we from human trials of Glycan use for the likes of HIV, Cancers and Alzheimer’s disease? Book, ‘Essentials of Glycobiology’ is available online and can be (Open Source)accessed via this book is currently being revised with an updated version was released this year via TA. 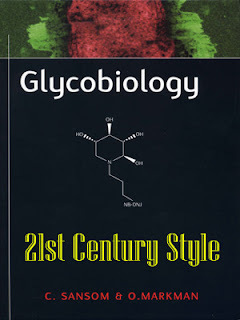 The Journal of Glycobiology published its first online Journal in September 1990. Whilst there has been an increasing wider focus of attention in the Glycobiology field over the last few years in particular, some of the core principles from a cellular level stretch back over a Century. In Australia and (limited extent) New Zealand in particular, Glycans continue to be used safely and successfully in the treatment of the arthritic joints (osteoarthritis) in both animal and man (1). The latest reported commentary (2) from the most recent Global Conference on AD in Madrid is highly suggestive that diabetes, whilst certainly not the cause, has a degree of interlinkage with a number of neurodegenerative diseases. With regards to Alzheimer’s (Amyloidosis generally) despite a substantial number of Peer reviewed published Papers showing Glycan promise in vitro and in vivo, there has been little/no interest from the Pharma Industry. To sense the ‘sweet flavour’ of the future of Glycobiology in the 21st Century, the word Glycomics comes to mind (3,4). Are such Generic based approaches deemed as potentially large threats to large Pharma? Good brief and this post helped me alot in my college assignement. Say thank you you on your information. This entry was posted on May 25, 2016 at 3:06 pm and is filed under Uncategorized. You can follow any responses to this entry through the RSS 2.0 feed. You can leave a response, or trackback from your own site.